16 Solarex MS120 Panels for free? Any good? Hi, A friend has offered me 16 Solarex MS120 panels for free. Actually a family member left them on his property and he wants them gone, lol. Anyways, I believe these panels where available around 2010 and are not longer offered. I am really new to solar, but have been wanting to get into it and been looking for free equipment to get started. Well, here is some. Can you tell me whether it is worth it drive and hour and grab these... are these still viable. What else would I need to get a solar setup going besides a ad/dc converter, solar regulator, and batteries? total newb to solar, if you couldnt tell. Free is always a fair price, most panels last in excess of 25 years unless something abnormal occurs, starting with panels is not the ideal approach to design but for a learning experience the price is right. With regards to the other components needed, that would depend largely on intended use, most will need some means of controlling and storage, charge controller/battery. Those sx 120's are likely older than 2010 vintage. Solarex sold out to BP, I believe, in the early 2000's. 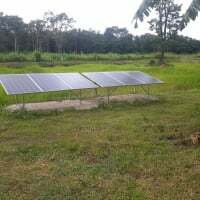 Those are 24 volt nominal panels and if functional would be perfect for getting your feet wet with solar, off grid education. Being 24 volt panels your simplest approach would be with a relatively inexpensive PWM type charge controller and a 24 volt battery bank. If you want to go with a 12 volt system you will need to start with a somewhat more expensive MPPT controller. The normal approach would be to identify your loads and build from there. I recommend you do a lot of reading here on this site and others to educate yourself in regards to what is required in designing and assembling an off grid system. It wouldn't hurt to start with a couple panels, controller and small battery bank. to get a feel for and power a few lights and charging devices but don't start buying any larger more expensive equipment till you have gotten better informed and understand how to design a balanced system fit for your eventual loads. Hmmmmm...in this case, I think I'd go for newer stock. Sometimes you get what you pay for and BP had some bad ones. There have been SO many advances in cell and module efficiency, old, inefficient panels are indeed, worth what you pay for them. I'm a cheapskate, but I'd pass. I'd also wonder what's wrong with them if he's dumping them for nothing. IMO, solar panels have not got much more efficient. Panel prices have plunged since those panels were purchased so the owner is probably not interested in trying to sell them. Probably nothing wrong with them unless they have visible physical damage. 3310 watts panels, Classic 200 controller, 8 Surette S530's, Xantrex 5548 inverter, Honda EX5500 backup Genny.